fashion // every day attire. if I were stranded on a deserted island going on vacation and could only bring one outfit, it’d be this. I could rave for days about maxi skirts [+ dresses]. paired with this beautiful floral top. it easily takes me from an afternoon wandering main street + it’s shops, to a nice dinner with my fiance. [floral blouse + statement necklace are from my favorite little boutique in cedar falls, IA – spotlight. see last summer’s shopping trip here]. if you were allowed one outfit, what would you pack? now that the weather is finally making a drastic turn towards the bright side, let’s talk warm weather attire. [as I’m saying this.. it’s 50°, windy, & rainy. ugh]. I am convinced that every woman needs to own at least 3 maxi dresses. absolutely convinced. they’re so versatile, you’d be doing a disservice to yourself by not owning one, or three. throw them on for a quick trip to the store. or add a statement necklace & a bright lip for a date night. not to mention the comfort. do it for yourself. 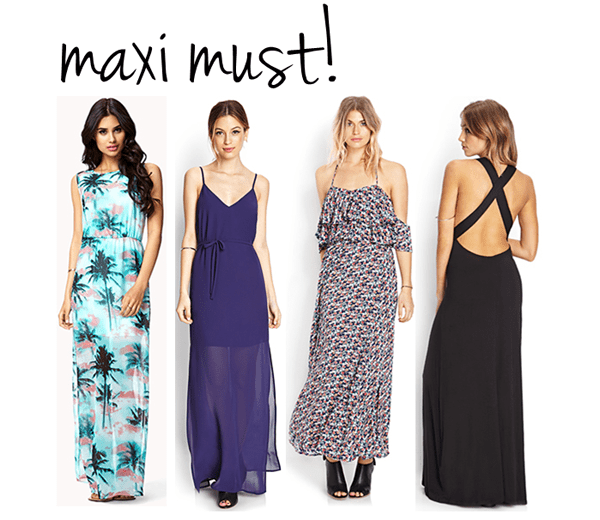 three reasons why you need a maxi dress. now. 1. to shield your sunburn legs from the previous pool day. [this could be just me]. 2. for this kind of morning – “oh no, I am going to be late and my legs aren’t perfectly shaven, but it’s too hot for pants”. 3. I can’t put in the necessary effort to pick out an outfit that matches. your closet is waiting – go shopping!! [it’s date night!!!! we’re super romantic ..$7 beer pitchers & half price boneless wings. clearly it takes a lot to make me happy].